FAQ: Are your motors IoT compatible? The Internet of Things (IoT) and Arduino compatibility was high on our list when we designed the RollerNode™, GrowerNode™ and BoaterNode™ remote control systems (with sensing) for residential and commercial applications. The Arduino system has been hugely successful due to the user-friendly software that comes with it, and we think it's a great way for hobbyists and interested individuals to start working with IoT devices. Our mission is to produce a series of user-friendly products that can be deployed to do useful things by anyone with common sense and a practical mind. We are developing a series of sensing and control products that will take the mystery out of microprocessor control systems, much like the Arduino ecosystem has. Our systems are easily monitored and controlled over the Internet, and can even be programmed remotely with "Over The Air" (OTA) programming. With its own dedicated programmable CPU, the controller is capable of making decisions based on input sensing, time, or other data. Nodes can run programmed scripts, and/or execute commands sent from a multi-channel hand held remote control. Use our pre-installed programs or bake your own via the on-board USB port. For more information and technical details, please visit our RollerNode™ blind, shade, LED, window and skylight motor controller page. The RollerNode™ motherboard also has a built-in breakout socket and daughterboard system where you can create your own circuitry, complementing the Arduino® Nano™ v3 microprocessor. Use our pre-programmed scripts, or write your own program code and upload it to directly to the RollerNode™ microprocessor via a standard USB port. Using the Veralite™ web server and our Z-wave interface, you can also control your system from any web enabled phone, tablet, PC. 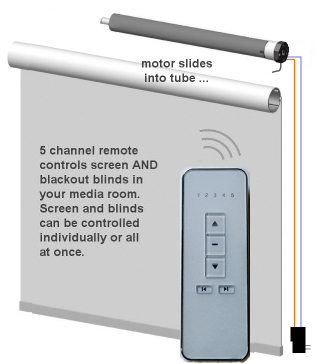 Automate blinds, shades, LED lighting, window openers, skylight motors, door locks, driveway gates, security systems or anything else you need to control.